Where does coffee come from? The coffee process from A to Z.
Arabica coffee is typically grown between the Tropic of Capricorn and the Tropic of Cancer. The coffee plants require mild temperatures – neither too hot nor too cold (a heavy frost will destroy the plants) – and about 60 inches of rainfall yearly. The best coffee is grown at high altitudes, typically between 4,000 and 6,000 feet above sea level. The beans mature slowly at the higher elevations due to cooler nights, allowing the sugars to develop and creating a dense, sweeter coffee bean. Arabica coffee represents approximately 70% of the world’s coffee production. Coffee beans are really seeds? Did you know that coffee isn’t really a bean? Coffee beans are really the seeds of red fruits that grow on the branches of coffee trees. The fruits come from the tree’s flowers, which usually first appear three to four years after a coffee tree is planted. These seeds, known as coffee “cherries,” are ready for picking when they have turned a ripe red –about eight months after the flowers blossom. Before the beans can be roasted, they need to be processed to separate the seeds from the cherries and remove the several layers of pulp and membranes. There are two methods preparing the moist coffee seed for export: dry processing and wet processing. Almost all of Cafe Campesino’s coffee is processed using the wet method. Although it requires the use of more equipment, the resulting product contains fewer defects and is more homogeneous. Step 1: A preliminary sort is done to remove items like twigs, rocks, and unripe/overripe cherries. This sort is accomplished with screens and separation through floating in water. Step 2: A pulping machine is used to remove the pulp from the cherry while it’s still wet, leaving the beans with their parchment covering. This is the primary difference between the wet and dry processing method. The dry process removes the pulp after drying instead of while it’s still wet. Step 3: The beans are separated from any remaining pulp through the use of vibrating screens. Step 4: It’s time for the mucilage, the gooey stuff covering the parchment, to be removed. The beans are fermented in a holding tank for 24-36 hours. Enzymes are used to break down the mucilage, and once it’s broken down, it gets washed away. Farmers determine fermentation time by hand – once the slimy texture is gone, it’s time to wash the beans. Step 5: The coffee beans are laid out on patios to dry in the sun during the day. The beans are rotated using rakes and collected every afternoon or if there is a threat of rain. The beans are dried in this manner until the moisture content in the beans has been reduced to the optimal level of 12.5% from its starting point of 50%. This is a labor-intensive practice that typically takes between 8 and 15 days. Step 6: The final step, called curing, is done right before the coffee is exported. The parchment is finally removed from the coffee beans, before the beans go through a series of cleaning, screening, sorting, and grading processes. 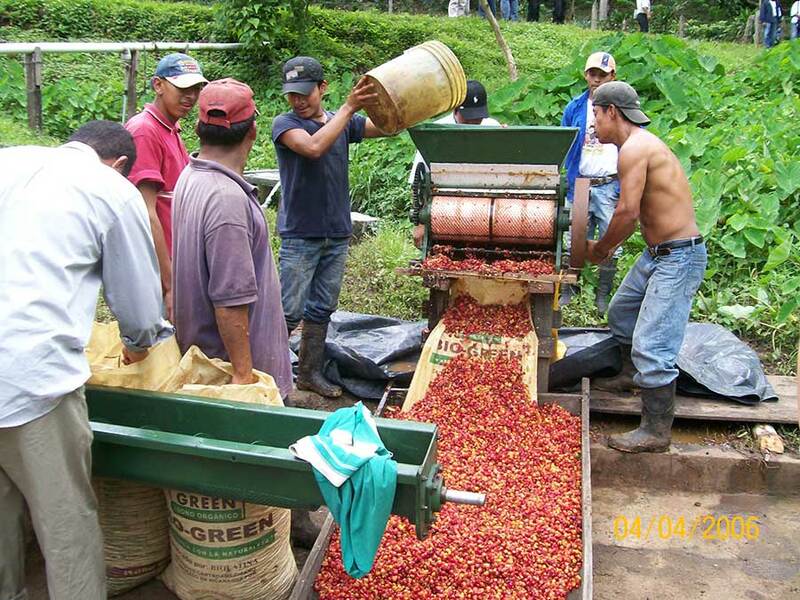 Defective beans are sometimes removed by using red eye sorting. After this step is complete, the coffee beans are poured into large jute bags and prepared for transport. Sometimes called the “dry processing” or “unwashed” method, natural processing is the oldest and simplest method to process coffee, and requires very little machinery. The goal of natural processing is to dry the entire cherry in three steps: cleaning, drying, and hulling. Step 1: Like wet processing, the first step is to separate the harvested cherries from anything that should not belong, including twigs, rocks, or unripe/overripe cherries. In natural processing, this step, known as winnowing, is accomplished by hand with the help of a sieve. Step 2: The cherries are spread out on huge concrete patios or on raised matted trestles to dry in the sun. Over a two week period, the beans are turned over by hand to ensure they dry evenly. The beans need to be dried to its optimal 12.5% moisture level. If the beans are too dry, they’ll break apart in the hulling process. If they’re too moist, they’re prone to mold. Step 3: The coffee beans are stored in silos until they’re sent to a mill for hulling, where a machine removes all the outer layers of the cherry at once. After hulling, the beans are cleaned, and sorted. Once that process is complete, the coffee is graded and prepared for export. After the coffee beans have been processed (either through the wet or natural method), the result is called a “green bean.” The green bean typically has a grassy, earthy aroma, and is the form of coffee exported by our trading partners. The green bean is hardly recognizable if you’re used to the little brown bean that most people associate with coffee. How do we get from this strange green bean to the delicious-smelling brown bean? Through the art and chemistry of the roasting process. Roasting the green beans chemically alters the hundreds of compounds found in a coffee bean and results in the rich aroma and flavor everyone loves. To roast the green beans, we load about 45 pounds of green coffee into the large pre-heated drum of our roasting machine. The drum slowly spins the beans at various temperatures for about 14 to 19 minutes. The roasting “recipe” is determined by our roastmaster and each origin has a recipe that best highlights the inherent flavors and aromas found in the bean. After a few minutes of roasting, popping sounds from inside the roaster indicate that the beans are well on their way to being properly roasted. Inside the roaster, the beans are undergoing a chemical process that includes a conversion of starches to sugars. This heating process also extracts the essential oil of coffee, caffeol, which is the primary source of the familiar taste and smell of coffee. The temperature, speed, and length of time green beans spend in the roaster change depending on the beans being roasted and the type of roasted coffee the roaster wants to create. The difference in these factors results in light, medium, or dark roasts. Green beans roasted for a shorter amount of time result in light roasts, while dark roasts stay in the roaster for a longer period of time. Determining the temperature and length of time coffee should be roasted is considered by many to be an art form. It takes lots of practice along with trial and error to coax the best flavor out of every bean.